Hi all. I’ve been meaning to write several posts to go over the reason why we do things the way we do so you can see there is a Method to the Madness! Today I want to talk about moving slowly on certain movements, how it will make you stronger and improve your breathing. When we do certain warmups like the dead bug, you’ve heard me say go slow, exhale, hold it, inhale. The reason why we do this is to allow our breathing to control the movement and not the other way around. We also want to focus on breathing fully, which many people fail to do. Not exhaling fully means you can’t inhale fully which leads to poor breathing patterns which in turn leads to poor movement patterns and possibly injuries. When doing the dead bug you should exhale through your pursed lips for a 5 to 6 count (1001,1002,1003 etc) while you are lowering the arm and opposite leg. This forces the core to engage, it’s like blowing up a ballon. Once fully extended, hold that exhale for a 3 count, then bring the leg and arm back up for another 3 count. This ensures we get not only a full exhale but we learn to inhale fully as well. The hold at the bottom helps improve core strength. 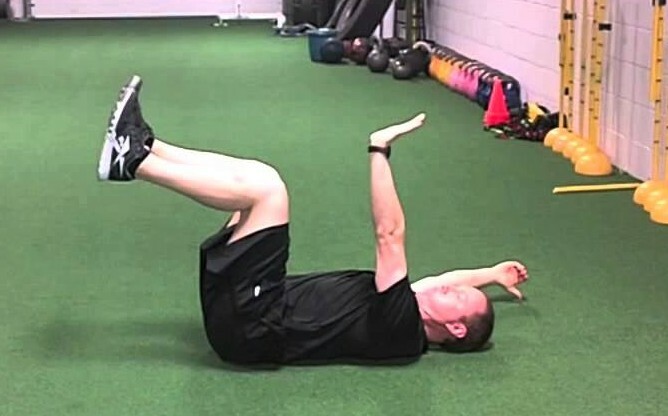 For those that are doing the dead bug with a bell, Core Engaged Leg Lowering is the technical name, the focus should still be on breathing and going slow. The bell should be lowered to about a 45 degree and and the elbows kept straight for maximum core engagement. It’s extremely important to keep the lower back on the floor during this exercise. Arching the back is a no-no for all lifts and shows lack of upper back mobility and weak core. In other movements like the ½ kneeling band exercises I will have you move fast on the concentric (contraction) part of the move but go slow when returning to the start position. This is to develop some power but still work the breathing and core strength. This also applies to movements like deadlifts and squats, slow on the way down, explosive on the way up. Speeding through movements that are supposed to be slow and controlled is a cheat to work around a weakness or imbalance. While it may feel good to fly through these movements and do a lot of reps, it’s better to focus on improving the quality of your movement rather than the quantity. I’d rather see you do 3 good pushups than 10 crappy ones! If you ever studied martial arts, Tai Chi in particular you know that you practice slowly to perfect the movements and over time the speed and power come by themselves. The same thing applies to many of the exercises/warm-ups/movements we do in every session. So take your time when i tell you to go slow and breath, you’ll get stronger faster, you’ll move better and reduce the risk of injury.